Hello, Bloggers, I have yet another review of a foreign horror/thriller film, but that is actually the trend I am doing for this year's Halloween segment. I am looking to try and focus on foreign or indie horror films that I feel should be recognized more and here is my next one: The French black-and-white thriller known as Diabolique. 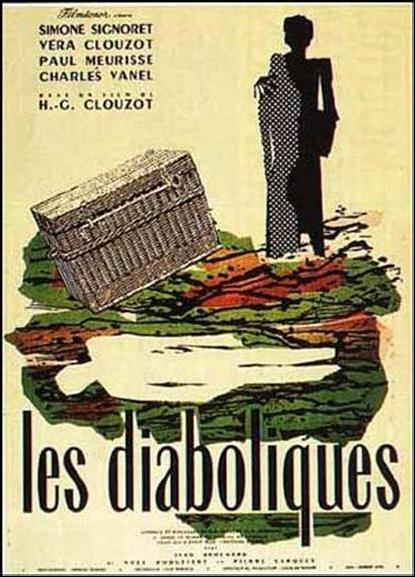 Diabolique, or Les Diaboliques, follows the story of two women: Christina (Vera Clouzot), teacher at a boy's boarding school, and Nicole (Simone Signoret), Christina's husband's mistress. Both Christina and Nicole have made plans to kill Christina's abusive husband. When they go through with it and dump the body, the body becomes missing and things slowly take a turn for the worse. First off, I did really like the performances from the two female leads. Although I thought the true star of the film is without a doubt, Vera Clouzot. She is just astounding as the wife who is at first skeptic about the whole scheme yet after she goes through with it, she goes through a struggle to not slip. She didn't even have to utter a peep to demonstrate that. The magic is all in her facial expressions. But Simone Signoret is equally as astounding as the more feisty Nicole. Another thing I really liked was how the film manages to gear its focus mainly on the killers. For some reason, I find those types of thrillers interesting and this one was no different. It was interesting how we watch the two women slowly succumb to the madness that affected the big decision they made in the film. Apparently, this film was the inspiration for Psycho, but I see this as more along the lines of Hitchcock's own Rope, which is told from the point of view of the antagonists. Although, I can see where the comparisons between this and Psycho lie. I'm not going to lie, I did have one slightly minor complaint. I thought at times, the pacing was a little off and the film was a little longer than it really needed to be. If they had cut out a few bits of Christina acting all skeptic, then it would've been shorter. Plus, even though Christina's husband is abusive, I thought the filmmakers made it a little too "on the nose" in terms of demonstrating that the husband is a creep. Overall, Les Diaboliques is a well-constructed Hitchcockian thriller that features stunning performances from its leading ladies. The film has its fair share of flaws, but it doesn't mean it isn't an inventive masterpiece. If you like Hitchcock or foreign films, I would definitely say go for it. But otherwise, maybe not. Although it is considered a film classic, so if you want to see any film placed under that category, then I would say "Yeah, sure".